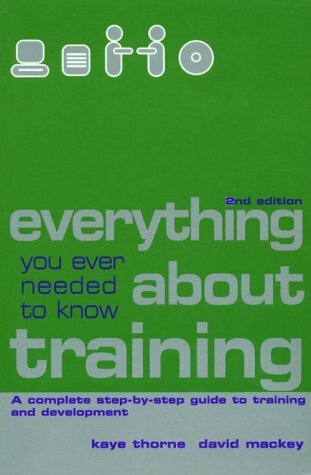 This volume is a jargon-free, hand-holding guide for those new to training or those wanting to develop their training skills. It covers everything from designing, delivering and evaluating training to advice on training as a career. Kaye Thorne is a well-respected talent coach, management consultant and founder of a creative consultancy based in the UK with associate partnerships in the US and Australia. She has worked with a number of leading organizations in developing their employer brand and is author of Coaching for Change, also published by Kogan Page. Sue Shortland is senior lecturer in HRM, London Metropolitan University.David Mackey spent 19 years with Unisys prior to setting up his own consultancy. As a freelance trainer he has developed and delivered customised training for many large organisations. David's commercial experience was initially developed in the high-pressure environment of computer sales to international 'blue-chip' companies. David started his consultancy, Client & Customer Focus in 1993. The consultancy designs and facilitates programmes of business process and skill for client account management, sales, marketing, management and personal development.